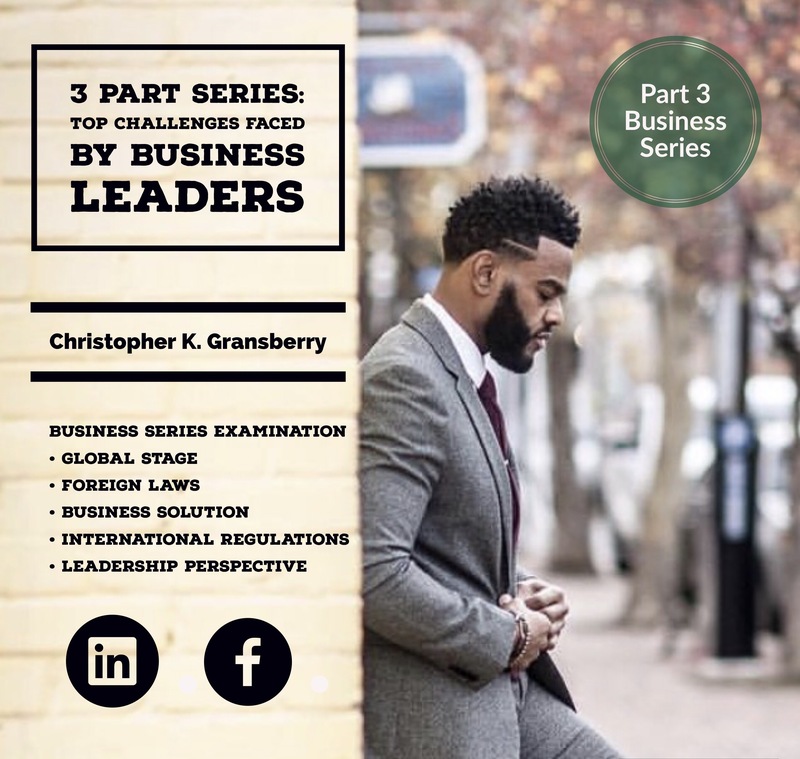 Part 3: Top Challenges Faced by Business Leaders – Christopher K. Gransberry Sr.
With the increased globalization, business leaders are seeking to expand their business internationally. They are facing an increasing challenge to understand the laws and regulations governing international practice, especially when the world is experiencing momentous political changes. According to David-Barrett, Yakis-Douglas, Moss-Cowan and Nguyen (2017), these shifting political variations are causing changes in the laws governing trade, corruption, taxes, and the legal requirements in setting up a business, among other significant changes. Keeping up with these changes is proving difficult even for the more established companies, owing to the possibilities of encountering new legal costs, eligibility criteria and new tariffs. Business leaders are being compelled to keep up with the labor and employment requirements, both locally and in international markets. For instance, some countries require employees be furnished with a stipulated time for maternity leave, while in others, this is not required. To address this problem, business leaders ought to understand all the complexities involved in the ever changing local political and social scene as well as in the process of expanding internationally. This is requiring for business leaders to invest in experienced and well-informed corporate counsel.